The Galápagos Islands are one of the best preserved ocea-nic archipelagos worldwide despite significant human impact over the last 500 years since their discovery [1Snell HL, Tye A, Causton CE, Bensted-Smith R. Estado y amenazas de la biodiversidad terrestre de Galápagos Visión para la biodiversidad de las islas Galápagos Fundación Charles Darwin para las islas Galápagos y WWF Puerto Ayora 2002; 43-60.]. Human impacts were already likely occurring on the flora and fauna by the time Charles Darwin visited the islands in 1835 [2Darwin C. Journal of researches into the natural history and geology of the countries visited during the voyage of H M S Beagle round the world 2nd ed. 2nd ed.1839 [cited 2018 June 20]; Available from: http://darwin-online.org.uk/content/frameset?item ID=F14&viewtype=side&pageseq=1, 3Perry R. The Islands and their history Key Environments Galápagos 1984; 1-14.]. At present, Galápagos has over 1 700 introduced species recorded, more than 30 000 people living on the islands, and more than 200 000 visitors per year [4Bungartz F, Herrera H, Jaramillo P, et al. Charles Darwin Foundation Species Checklist Charles Darwin Foundation, Puerto Ayora, Galápagos 2009 [updated 2017; cited 2018 June 20]; http:// darwinfoundation.org/ datazone/ checklists, 5Izurieta JC. Galápagos Report 2015-2016 GNPD, CGREG, CDF and GC Behavior and trends in tourism in Galápagos between 2007 and 2015 Puerto Ayora, Galápagos, Ecuador 2017; 83-9.]. The Galápagos avifauna is regulated by density-dependent (e.g. predation, competition, food shortages, disease, territory) and density-independent factors (El Niño–Southern Oscillation [ENSO] and geological events, e.g. volcanic activity and tsunamis), keeping populations in balance (i.e. population regulation, equilibrium) in the face of large fluctuations. However, human-made activities from outside and from within Galápagos directly or indirectly affect bird species on the Islands [6Bensted-Smith R, Ed. Visión para la biodiversidad de las Islas Galápagos Fundación Charles Darwin para las islas Galápagos y WWF 2002.-14Crawford R, Ellenberg U, Frere E, et al. Tangled and drowned: A global review of penguin bycatch in fisheries. Endanger Species Res 2017; 34: 373-96. [http://dx.doi.org/10.3354/esr00869] ]. The main threats aff-ecting the Galápagos avifauna (following the IUCN class-ification) are climate change and severe weather, human intrus-ions and disturbance, biological resource use (incidental and direct fishing), invasive and other problematic species, genes and diseases, pollution (chemical and biological contamination, solid waste, urban sprawl), geological events and loss of genetic diversity [15IUCN.. The IUCN Red List of Threatened Species Version 20181 2018 [updated 2018; cited 2018 November 13. ]; Available from https://www.iucnredlist.org/]. The categorization of species by the International Union for the Conservation of Nature’s Red List of Threatened Spe-cies (the “Red List”) is useful to prioritize efforts and actions regarding species conservation. To date, 172 bird species have been recorded in Galápagos, including endemic (found only in Galápagos), native (occur naturally in Galápagos but also elsewhere), and migratory species. Of these, 32 (18.6%) are listed as threatened (1 Extinct, 4 Critically Endangered, 7 Endangered, 20 Vulnerable) [16Jiménez-Uzcátegui G, Wiedenfeld DA, Vargas FH, Snell HL. CDF checklist of Galápagos birds. Charles Darwin Foundation Galápagos Species Checklist. Charles Darwin Foundation, Puerto Ayora, Galápagos 2017 January 16; [cited 2018 June 20]; Available from http:// darwinfoundation.org/ datazone/ checklists/ vertebrates/ aves/]. Of the endemic species, the Least Vermilion Flycatcher (Pyrocephalus dubius) from San Cristóbal Island is considered Extinct, although this needs confirmation as there is an unconfirmed record in 2008 [17Carmi O, Witt CC, Jaramillo A, Dumbacher JP. Phylogeography of the Vermilion Flycatcher species complex: Multiple speciation events, shifts in migratory behavior, and an apparent extinction of a Galápagos-endemic bird species. Mol Phylogenet Evol 2016; 102: 152-73. [http://dx.doi.org/10.1016/j.ympev.2016.05.029] [PMID: 27233443] , 18Fessl B, Anchundia D, Carrión J, et al. Galápagos landbirds (passerines, cuckoos, and doves): Status, threats, and knowledge gaps. Galápagos Report 2015-2016 GNPD, GCREG, CDF AND GC Puerto Ayora, Ecuador 2017; 149-60.]. It is important to note here that the conservation status of a species can change over time due to changes in taxonomy, observed changes in populations, changes in the evaluation system, the discovery of new extant species, and an increase of threats. Numerous bird studies have been done on the Galápagos during the last two centuries. These studies mainly focused on individual species, contributed a better knowledge on the ecology and evolution of Galapagos avian diversity [7Granizo T, Pacheco C, Rivadeneira MB, Guerrero M, Suárez L, Eds. Libro Rojo de las aves del Ecuador. SIMBIOE/ Conservación Internacional/ EcoCiencia/ Ministerio del Ambiente/ IUCN Serie Libros Rojos del Ecuador, tomo 2 Quito, Ecuador 2002., 9Wiedenfeld DA, Jiménez-Uzcátegui G. Critical problems for bird conservation in the Galápagos Island. Cotinga 2008; 29: 22-7., 10Alava JJ, Haase B. Waterbird biodiversity and conservation threats in coastal ecuador and the Galapagos Islands. In: Grillo O, Ed. Ecosystems Biodiversity 2011; 271-314., 16Jiménez-Uzcátegui G, Wiedenfeld DA, Vargas FH, Snell HL. CDF checklist of Galápagos birds. Charles Darwin Foundation Galápagos Species Checklist. Charles Darwin Foundation, Puerto Ayora, Galápagos 2017 January 16; [cited 2018 June 20]; Available from http:// darwinfoundation.org/ datazone/ checklists/ vertebrates/ aves/]. However, general bird threats increased during this time in such a manner that it seems to outweigh our understanding of their interaction with bird species likely limiting current mana-gement and conservation programs. Therefore, the aim of this study was to evaluate the past and current status of knowledge in regards to the threats in the islands and project scenarios to understand future trends to contribute to the management and overall conservation of the Galapagos avifauna. To accomplish this, potential management actions are proposed under two scenarios (i.e. Status Quo [SQ] and Vision [V]) by assessing and predicting the impacts on species’ population trends. In Galápagos, 61 avian species are indigenous (i.e. end-emic, native) [16Jiménez-Uzcátegui G, Wiedenfeld DA, Vargas FH, Snell HL. CDF checklist of Galápagos birds. Charles Darwin Foundation Galápagos Species Checklist. Charles Darwin Foundation, Puerto Ayora, Galápagos 2017 January 16; [cited 2018 June 20]; Available from http:// darwinfoundation.org/ datazone/ checklists/ vertebrates/ aves/]. We choose to work with 20 species registered in the IUCN Red List because these species are the most endangered and upon which conservation efforts and management plans must be prioritized. Furthermore, these species are representative and inhabitants of diverse ecological areas or unique habitats (i.e. marine and coastal habitats, transition zones, and arid and humid habitats) and several species would qualify as sentinel species or bioindicators [7Granizo T, Pacheco C, Rivadeneira MB, Guerrero M, Suárez L, Eds. Libro Rojo de las aves del Ecuador. SIMBIOE/ Conservación Internacional/ EcoCiencia/ Ministerio del Ambiente/ IUCN Serie Libros Rojos del Ecuador, tomo 2 Quito, Ecuador 2002., 15IUCN.. The IUCN Red List of Threatened Species Version 20181 2018 [updated 2018; cited 2018 November 13. ]; Available from https://www.iucnredlist.org/, 19National Research Council. Animals as sentinels of environmental health hazards 1991.-22Fundación Charles Darwin (FCD) y WWF-Ecuador. Atlas de Galápagos, Ecuador: Especies Nativas e Invasoras 2018.]. We evaluated species threats following criteria of the IUCN Red List of Threatened Species, including climate change and severe weather, human intrusions and disturbances, biological resource use (incidental and direct fishing), invasive species, diseases, chemical pollution, geological events and loss of genetic diversity. This assessment included seabirds and aquatic birds Table 1 and land birds Table 2. The Avian Diversity Vision scenario was developed from a workshop, in which we used all available knowledge of Gal-ápagos ecosystems and ecological trends, field experience and the existing scientific literature available, including peer-reviewed papers, grey literature (e.g., technical reports, papers presented in conferences), information from the Check List and Natural History Collection at CDF, and best available expert knowledge (authors). The rationale for this methodology was following the central idea from the “Vision for the biodiversity of the Galápagos Islands” which are based on the guiding principles by Bensted-Smith [6Bensted-Smith R, Ed. Visión para la biodiversidad de las Islas Galápagos Fundación Charles Darwin para las islas Galápagos y WWF 2002.]. following an expert workshop on Galapagos conservation developed in 1999, in which two of the co-authors (CAV & HV) participated. The El Niño-Southern Oscillation (ENSO - El Niño [wa-rm] and La Niña [cold] events) has affected the Galápagos Islands for thousands of years and the native species have evolved under its influence [23Grant PR, Grant BR. How and why species multiply: the radiation of Darwin’s finches 2008.]. Climate change will likely increase the frequency and intensity of El Niño events [24Wang G, Cai W, Gan B, et al. Continued increase of extreme El Niño frequency long after 1.5°C warming stabilization. Nat Clim Chang 2017; 7: 568-72. [http://dx.doi.org/10.1038/nclimate3351] ]. As shown in Table 1, severe El Niño events in 1982-1983 and 1997-1998 caused populations of Galápagos Penguins (Sphen-iscus mendiculus) to decrease by 80% and 60%, and populations of Flightless Cormorants (Phalacrocorax harrisi) by 50% and 25%, respectively [8Vargas FH, Harrison S, Rea S, Macdonald DW. Biological effects of El Niño on the Galápagos Penguin. Biol Conserv 2006; 127: 107-14. [http://dx.doi.org/10.1016/j.biocon.2005.08.001] , 13Vargas FH, Lacy RC, Johnson PJ, et al. Modelling the effect of El Niño on the persistence of small populations: The Galápagos penguin as a case study. Biol Conserv 2007; 137: 138-48. [http://dx.doi.org/10.1016/j.biocon.2007.02.005] , 25Valle CA, Coulter MC. Present status of the Flightless Cormorant, Galápagos Penguin and Greater Flamingo populations in the Galápagos Islands, Ecuador, after the 1982-83 El Niño. The Condor 1987; 89: 276-81. [http://dx.doi.org/10.2307/1368480] , 26Valle CA, Cruz F, Cruz JB, Merlen G, Coulter MC. The impact of the 1982-83 El Niño-Southern Oscillation on seabirds in the Galápagos Islands, Ecuador. J Geophys Res 1987; 92: 437-44. [http://dx.doi.org/10.1029/JC092iC13p14437] ]. Reproduction of Waved Albatrosses (Phoebastria irrorata) was affected in 1982-1983 and 2015-2016 ([27Rechten C. Factors determining the laying date of the Waved Albatross (Diomedea irrorata). Ibis 1986; 128: 492-501. [http://dx.doi.org/10.1111/j.1474-919X.1986.tb02701.x] ], GJU, per. obs.). In other cases, El Niño affected the habitat by changing the natural ecosystems of lagoons inhabited by aquatic birds and thus affecting threatened species, including the Galápagos Ameri-can Flamingo (Phoenicopterus ruber glyphorhynchus) [28Vargas FH, Barlow S, Har T, et al. Effects of climate on the abundant and distribution of flamingos in the Galápagos Islands. JPN J Zool 2008; 276: 252-65. [http://dx.doi.org/10.1111/j.1469-7998.2008.00485.x] ]. Although the impact of climate change on several large-scale ocean-climatic perturbations (e.g. ENSO episodes) is dif-ficult to predict with certainty, it has been suggested that global climate change may result in continued, more frequent, and intense El Niño events coupled with higher sea-surface temp-erature, increased precipitation, sea level rise, ocean acidification, and a reduction in upwelling in the Galápagos archipelago [29Timmermann A, Oberhuber J, Bacher A, Esch M, Latif M, Roeckner E. Increased El Niño frequency in a climate model forced by future greenhouse warming. Nature 1999; 398: 694-7. [http://dx.doi.org/10.1038/19505] -31Sachs JP, Ladd N. Climate and oceanography of the Galápagos in the 21st century: Expected changes and research needs. Galapagos Research 2010; 67: 50-1.]. Therefore, it is likely that the most significant threat from climate change is its potential to affect the frequency and severity of ENSO events, impacting Galápagos sea birds and coastal waterbirds [8Vargas FH, Harrison S, Rea S, Macdonald DW. Biological effects of El Niño on the Galápagos Penguin. Biol Conserv 2006; 127: 107-14. [http://dx.doi.org/10.1016/j.biocon.2005.08.001] , 9Wiedenfeld DA, Jiménez-Uzcátegui G. Critical problems for bird conservation in the Galápagos Island. Cotinga 2008; 29: 22-7.] Furthermore, ENSO events may also affect the habitat of land birds and possibly the prevalence of infectious diseases carried by biological vectors, such as mosquitoes and flies, which may be affected by availability of water [1Snell HL, Tye A, Causton CE, Bensted-Smith R. Estado y amenazas de la biodiversidad terrestre de Galápagos Visión para la biodiversidad de las islas Galápagos Fundación Charles Darwin para las islas Galápagos y WWF Puerto Ayora 2002; 43-60.]. Assessment of threats, current actions and mitigation and management strategies under Status Quo (SQ) and the Vision (V) for the conservation of Galápagos avian diversity: seabirds and aquatic birds, including indigenous species (i.e. endemic and native). Assessment of threats, current action and mitigation and management strategies under status quo (SQ) and the vision (V) for the conservation of Galápagos avian diversity: terrestrial birds, including indigenous species (i.e. native and endemic). Conversely, ENSO events could be beneficial for terrestrial birds in Galápagos because greater rainfall increases the food availability for land birds, although this positive impact could be a double-edged sword promoting the establishment and spread of invasive insects and plants [32Gibbs HL, Grant PR. Ecological consequences of an exceptionally strong El Nino event on Darwin’s Finches. Ecology 1987; 68(6): 1735-46. [http://dx.doi.org/10.2307/1939865] [PMID: 29357173] , 33Mooney HA, Cleland EE. The evolutionary impact of invasive species. Proc Natl Acad Sci USA 2001; 98(10): 5446-51. [http://dx.doi.org/10.1073/pnas.091093398] [PMID: 11344292] ] (Table 2). Other effects derived from climate change may include changes of ocean circulation pattern, that in turn may affect food abundance and shifts in foraging ground for seabirds. With the establishment of Galápagos National Park in the 1960s, 96.7% of the land area in the Galápagos was designated as protected (including tourism areas). The remaining per-centage is used for urban and agricultural areas, roads and docks [34DPNG. Plan de manejo Parque Nacional Galápagos Ministerio del ambiente 2006.]. However, since the time that humans arrived to the islands, they began impacting the islands because of the necessity for roads, houses and demand for food. The estab-lishment of agricultural and military areas was inevitable. The islands occupied by humans were Floreana, San Cristóbal, Isabela, Santa Cruz, Baltra, and Santiago, with towns prin-cipally located near the coast and agriculture found in the trans-ition and humid zones, as these areas provided more natural resources to humans [3Perry R. The Islands and their history Key Environments Galápagos 1984; 1-14.]. In the last fifty years, several islands and islets in the Galápagos archipelago have been restored, including Santiago, Baltra, and Plazas. However, on inhabited islands (Santa Cruz, Santa Cristóbal, Floreana, and Isabela), approximately 3.96% of land area was converted to agricultural use, and the pro-portion of humid zones in natural condition has diminished. The arid and transition vegetation zones have also been aff-ected [35Kerr S, Cardenas S, Hendy J. Migration and the environment in the Galápagos: An analysis of economic and policy incentives driving migration, potential impacts from migration control, and potential policies to reduce migration pressure Motu Working Paper 03-17 Motu Economic and Public Policy Research Trust, Wellington, New Zealand 2004. [http://dx.doi.org/10.29310/wp] ]. This has reduced the natural habitat available for several species such as Galápagos Petrel (Pterodroma phae-opygia), Lava Gull (Leucophaeus fuliginosus), Galápagos Short-eared Owl (Asio flammeus galapagoensis), San Cristóbal Mockingbird (Mimus melanotis), Galápagos Rail (Laterallus spilonota), Medium Tree-finch (Camarhynchus pauper), and Vegetarian Finch (Platyspiza crassirostris). It has also caused the extirpation of some island populations such as Floreana Mockingbird (Mimus trifasciatus), Galápagos Rail, Little Vermilion Flycatcher (Pyrocephalus nanus), Vegetarian Finch, Gray Warbler-Finch on Floreana Island and the extinction of Least Vermilion Flycatcher (Pyrocephalus dubius) [17Carmi O, Witt CC, Jaramillo A, Dumbacher JP. Phylogeography of the Vermilion Flycatcher species complex: Multiple speciation events, shifts in migratory behavior, and an apparent extinction of a Galápagos-endemic bird species. Mol Phylogenet Evol 2016; 102: 152-73. [http://dx.doi.org/10.1016/j.ympev.2016.05.029] [PMID: 27233443] , 36Dvorak M, Nemeth E, Wendelin B, et al. Conservation status of landbirds on Floreana: The smallest inhabited Galápagos Island. J Field Ornithol 2017; 88: 132-45. [http://dx.doi.org/10.1111/jofo.12197] , 37Jiménez-Uzcátegui G, Ortiz-Catedral L. Vertebrate diversity on Floreana Island, Galápagos. Galapagos Research 2017.] (Tables 1 and 2). Human activities also interact with species like the Gal-ápagos Penguins (Spheniscus mendiculus), which are affected by collisions with motorboats in breeding areas. The Flightless Cormorant (Phalacrocorax harrisi) and Waved Albatross (Phoebastria irrorata) are also disturbed by human inter-actions on their breeding areas (Table 1). Other examples occur on terrestrial habitats, where land birds are killed in collisions on the road with automobiles especially on Santa Cruz Island [38Jiménez-Uzcátegui G, Betancourt F. Galápagos Report 2007-2008 FCD, PNG & INGALA Bird mortality by vehicles Puerto Ayora, Ecuador 2008; 103-6.] (Table 2). While fisheries, mainly longline fisheries, are the principal threat affecting the survival of the Waved Albatross (Pho-ebastria irrorata) outside of Galápagos Marine Reserve (GMR) [10Alava JJ, Haase B. Waterbird biodiversity and conservation threats in coastal ecuador and the Galapagos Islands. In: Grillo O, Ed. Ecosystems Biodiversity 2011; 271-314., 39Awkerman JA, Huyvaert KP, Mangel J, Alfaro-Shigueto J, Anderson DJ. Incidental and intentional catch threatens Waved Albatross. Biol Conserv 2006; 133: 483-9. [http://dx.doi.org/10.1016/j.biocon.2006.07.010] , 40Jiménez-Uzcátegui G, Mangel J, Alfaro-Shigueto J, Anderson DJ. Fishery bycatch of the Waved Albatross Phoebastria irrorata, a need for implementation of agreements. Galápagos Research 2006; 64(2): 7-9. ], Galápagos Penguins are exposed to interactions with artisanal fisheries in the GMR [14Crawford R, Ellenberg U, Frere E, et al. Tangled and drowned: A global review of penguin bycatch in fisheries. Endanger Species Res 2017; 34: 373-96. [http://dx.doi.org/10.3354/esr00869] ] (Table 1). On land, the human persecution has caused the extirpation of some birds populations on inhabited islands such as the Gal-ápagos Hawk (Buteo galapagoensis) on Santa Cruz and San Cristóbal Islands, and Galápagos Barn Owl (Tyto alba pun-ctatissima) on Floreana Island [41Steadman DW. Holocene vertebrate fossils from Isla Floreana, Galápagos. Smithson Contrib Zool 1986; 413: 1-103. [http://dx.doi.org/10.5479/si.00810282.413] ] (Table 2). Invasive species emerged as a threat as soon as humans arrived on the islands. Introduced plants and animals affected all species directly or indirectly, causing serious or irreparable damages. In addition to predation on eggs, chicks, and adults, introduced species compete for habitats and food, carry or become reservoirs of infectious pathogens and can also be biological vectors of diseases and parasites [1Snell HL, Tye A, Causton CE, Bensted-Smith R. Estado y amenazas de la biodiversidad terrestre de Galápagos Visión para la biodiversidad de las islas Galápagos Fundación Charles Darwin para las islas Galápagos y WWF Puerto Ayora 2002; 43-60., 9Wiedenfeld DA, Jiménez-Uzcátegui G. Critical problems for bird conservation in the Galápagos Island. Cotinga 2008; 29: 22-7., 42Jiménez-Uzcátegui G, Carrión V, Zabala J, Buitrón P, Milstead B. Galápagos Report 2006-2007 FCD, PNG & INGALA Status of introduced vertebrates in Galápagos Puerto Ayora, Ecuador 2007; 136-41.] (Tables 1 and 2). The indigenous bird species in Galápagos have endemic pathogens and parasites. Significant trauma to the native fauna can occur when introduced pathogens or parasites enter pristine areas, as occurred in Hawaii or New Zealand. On those islands, many species went extinct when non-native avian pox and avian malaria were introduced [43Ralph J, van Riper C III. Historical and current factors affecting Hawaiian native birds Bird Conservation 1985; Vol. II: 7-42., 44Wikelski M, Foufopoulos J, Snell H, Vargas FH. Galápagos birds and diseases: Invasive pathogens as threats for island species. Ecol Soc 2004; 9(1): 5. [http://dx.doi.org/10.5751/ES-00605-090105] ]. In Galápagos, avian pox virus affects 15 species and has been present on the islands for more than 110 years [45Jiménez-Uzcátegui G, Wiedenfeld DA, Parker PG. Passeriformes afectados con viruela aviar en la Isla Santa Cruz, Galápagos. Brenesia 2007; 67: 29-34.-48Tompkins EM, Anderson DJ, Pabilonia KL, Huyvaert KP. Avian pox discovered in the critical endangered waved albatross (Phoebastria irrorata) from the Galápagos Islands, Ecuador. J Wildl Dis 2017; 53(4): 891-5. [http://dx.doi.org/10.7589/2016-12-264] [PMID: 28715294] ]. Avian malaria (Plasmodium sp.) has been recorded in eight species including the Galápagos Penguin (Spheniscus mendiculus) [49Levin II, Zwiers P, Deem S, et al. Multiple lineages of avian malaria parasites (Plasmodium) in the Galápagos Islands and evidence for arrival via migratory birds. Conserv Biol 2014. [http://dx.doi.org/10.1111/cobi.12127] [PMID: 24033638] ]. The ectoparasite Phil-ornis downsi affects more than 17 species and is present on more than 10 islands and islets in the Galápagos. It reduces the reproductive success of Passeriformes, affecting Critical En-dangered species such as Mangrove Finch (Camarhynchus heliobates) [50Wiedenfeld DA, Jiménez-Uzcátegui G, Fessl B, Kleindorfer S, Valarezo J. Distribution of the introduced parasitic fly P. downsi (Diptera, Muscidae) in the Galápagos Islands. Pac Conserv Biol 2007; 13(1): 14-9. [http://dx.doi.org/10.1071/PC070014] -54Fessl B, Glyn YH, Young RP, et al. How to save the rarest Darwin’s finch from extinction: The mangrove finch on Isabela Island 2010; 1019-30.]. Endoparasites have been recorded from Galápagos Penguin (Spheniscus mendiculus), Flightless Cormorant (Phalacrocorax harrisi), and Waved Albatross (Phoebastria irrorata), but they are common on marine birds [55Carrera-Játiva P, Rodríguez-Hidalgo R, Sevilla C, Jiménez-Uzcátegui G. Gastrointestinal parasites in the Galápagos Penguin Spheniscus mendiculus and the Flightless Cormorant Phalacrocorax harrisi in the Galápagos Islands. Mar Ornithol 2014; 42: 77-80., 56Jiménez-Uzcátegui G, Sarzosa MS, Encalada E, Rodríguez-Hidalgo R, Huyvaert KP. Gastrointestinal Parasites in the Waved Albatross (Phoebastria irrorata) of Galápagos. J Wildl Dis 2015; 51(3): 784-6. [http://dx.doi.org/10.7589/2014-06-165] [PMID: 25919468] ] (Table 1). Oils spills represent one of the major threats in terms of marine pollution for seabirds in the Galápagos [11Alava JJ, Palomera C, Bendell L, Ross PS. Pollution as a threat for the conservation of the Galapagos Marine Reserve: Environmental Impacts and Management Perspectives The Galapagos Marine Reserve: A dynamic socio- ecological system 2014; 247-83.]. On 16 January 2001, a large oil spill at Naufragio Bay, San Cristóbal Island, caused by the wreck of the tanker MV Jessica thre-atened a significant area of the Galápagos Marine Reserve. The oil tanker released almost 100% of its total cargo consisting of 302,824 L of Fuel Oil 120 (bunker fuel) and 605,648 L of Diesel oil [57Lougheed LW, Edgar GJ, Snell HL. Biological impacts of the Jessica oil spill on the Galápagos environment Final report 2002., 58Gelin A, Gravez V, Edgar GJ. Assessment of Jessica oil spill impacts on intertidal invertebrate communities. Mar Pollut Bull 2003; 46(11): 1377-84. [http://dx.doi.org/10.1016/S0025-326X(03)00368-0] [PMID: 14607 536] ]. Afterward, researchers conducting fieldwork on Española Island found five oiled Nazca Boobies (Sula granti) in January 2001, one oiled Waved Albatross (Phoebastria irrorata) in June 2001, and two oiled Nazca Boobies (Sula granti) in November 2001, indicating that these birds were polluted by spilled oil [59Anderson DJ, Huyvaert KP, Wood DR, Gillikin CL, Frost BJ, Mouritsen H. At-sea distribution of waved albatrosses and the Galápagos Marine Reserve. Biol Conserv 2003; 110(3): 367-73. [http://dx.doi.org/10.1016/S0006-3207(02)00238-0] ]. A second oil spill took place in the Galápagos in early July 2002, when a small tanker (BAE Taurus) sank and spilled diesel fuel in waters off the coast of Puerto Villamil, Isabela Island. Fortunately, most of the populations of endangered seabirds, such as Galápagos Penguin (Spheniscus mendiculus) and Flightless Cormorant (Phalacrocorax harrisi), were not affected by the direct impact of these spills [11Alava JJ, Palomera C, Bendell L, Ross PS. Pollution as a threat for the conservation of the Galapagos Marine Reserve: Environmental Impacts and Management Perspectives The Galapagos Marine Reserve: A dynamic socio- ecological system 2014; 247-83.]. However, the chemical exposure of seabirds to chronic residual levels of oil hydrocarbons in the long term is unknown. Elevated plasma corticosterone levels, reduction in growth, and high mortality were found in the endemic Galápagos marine iguanas (Amblyrhynchus cristatus) exposed to residual hydrocarbon traces during and/or after the MV Jessica oil spill [60Wikelski M, Romero LM, Snell HL. Marine iguanas oiled in the Galápagos. Science 2001; 292(5516): 437-8. [http://dx.doi.org/10.1126/science.292.5516.437c] [PMID: 11330292] -62Romero LM, Wikelski M. Severe effects of low-level oil contamination on wildlife predicted by the corticosterone-stress response: preliminary data and a research agenda. Spill Sci Technol Bull 2002; 7: 309-13. [http://dx.doi.org/10.1016/S1353-2561(02)00067-1] ]. This finding suggests that even low levels or traces of oil hydrocarbons have critical negative effects for marine iguanas and possibly with marine birds on Galápagos. Although only a few studies have been carried out on persistent, bioaccumulative and toxic contaminants, including Persistent Organic Pollutants (POPs) and organic mercury (MeHg) as well as several other heavy metals and conta-minants of emerging concerns (such as microplastics and pharmaceutical and personal care products (PPCPs)) in Galápagos [11Alava JJ, Palomera C, Bendell L, Ross PS. Pollution as a threat for the conservation of the Galapagos Marine Reserve: Environmental Impacts and Management Perspectives The Galapagos Marine Reserve: A dynamic socio- ecological system 2014; 247-83., 63Alava JJ, Ross PS. Pollutants in tropical marine mammals of the Galapagos Islands, Ecuador: An Ecotoxicological Quest to the Last Eden Marine Mammal Ecotoxicology: impacts of multiple stressors on population health 2018; 213-34. ], recent ecotoxicological research has shown that the Galápagos are not immune to the global and regional pollution by organic contaminants in marine biota [11Alava JJ, Palomera C, Bendell L, Ross PS. Pollution as a threat for the conservation of the Galapagos Marine Reserve: Environmental Impacts and Management Perspectives The Galapagos Marine Reserve: A dynamic socio- ecological system 2014; 247-83.]. This has been demonstrated by the exposure to Persistent Organic Pollutants (POPs) in Galápagos sea lion (Zalophus wollebaeki) and marine fish [10Alava JJ, Haase B. Waterbird biodiversity and conservation threats in coastal ecuador and the Galapagos Islands. In: Grillo O, Ed. Ecosystems Biodiversity 2011; 271-314., 11Alava JJ, Palomera C, Bendell L, Ross PS. Pollution as a threat for the conservation of the Galapagos Marine Reserve: Environmental Impacts and Management Perspectives The Galapagos Marine Reserve: A dynamic socio- ecological system 2014; 247-83., 63Alava JJ, Ross PS. Pollutants in tropical marine mammals of the Galapagos Islands, Ecuador: An Ecotoxicological Quest to the Last Eden Marine Mammal Ecotoxicology: impacts of multiple stressors on population health 2018; 213-34.-66Alava JJ, Ross PS, Ikonomou MG, et al. DDT in endangered Galapagos sea lions (Zalophus wollebaeki). Mar Pollut Bull 2011; 62(4): 660-71. [http://dx.doi.org/10.1016/j.marpolbul.2011.01.032] [PMID: 21353 257] ]. Both exposures to and biomagnification of POPs (e.g. polychlorinated biphenyls (PCBs) and dichlorodiphenyltrich-loroethanes (DDTs), and several others organochlorine pesti-cides) have been documented for the Galápagos sea lion food chain [63Alava JJ, Ross PS. Pollutants in tropical marine mammals of the Galapagos Islands, Ecuador: An Ecotoxicological Quest to the Last Eden Marine Mammal Ecotoxicology: impacts of multiple stressors on population health 2018; 213-34.-66Alava JJ, Ross PS, Ikonomou MG, et al. DDT in endangered Galapagos sea lions (Zalophus wollebaeki). Mar Pollut Bull 2011; 62(4): 660-71. [http://dx.doi.org/10.1016/j.marpolbul.2011.01.032] [PMID: 21353 257] ]. Of particular concern is the presence of POPs, mainly DDT, found in two fish prey species of Galápagos sea lions, i.e. thread herrings (Ophistonema berlangai) and mullets, (Mugil sp.) [63Alava JJ, Ross PS. Pollutants in tropical marine mammals of the Galapagos Islands, Ecuador: An Ecotoxicological Quest to the Last Eden Marine Mammal Ecotoxicology: impacts of multiple stressors on population health 2018; 213-34., 65Alava JJ, Gobas FAPC. Assessing Biomagnification and Trophic Transport of Persistent Organic Pollutants in the food chain of the Galapagos sea lion (Zalophus wollebaeki): Conservation and Management Implications New Approaches to the Study of Marine Mammals 2012; 77-108. ], which can also serve as potential prey for seabirds. This underscores the potential for biomagnification of these contaminants in the food chain of top predators, including biomagnification in the marine food web of seabirds and terrestrial food web of raptors (e.g., Galapagos hawk’s food web). There is also strong evidence that current-use pesticides (CUPs) were used in the Galápagos [11Alava JJ, Palomera C, Bendell L, Ross PS. Pollution as a threat for the conservation of the Galapagos Marine Reserve: Environmental Impacts and Management Perspectives The Galapagos Marine Reserve: A dynamic socio- ecological system 2014; 247-83.]. While CUPs include organophosphate and carbamate classes, a wide variety of other groups of pesticides seem to have been applied in the Galápagos, including insecticides such as neonicotinoid (Acetamiprid) and synthetic Pyrethroids (PYR) (i.e. Del-tamethrin to control the biovector of dengue, the mosquito Aedes aegypti) as well as herbicides such as glyphosate (Rodeo or Roundup) and paraquat (Gramoxone) to eliminate weeds and invasive vegetation [11Alava JJ, Palomera C, Bendell L, Ross PS. Pollution as a threat for the conservation of the Galapagos Marine Reserve: Environmental Impacts and Management Perspectives The Galapagos Marine Reserve: A dynamic socio- ecological system 2014; 247-83., 63Alava JJ, Ross PS. Pollutants in tropical marine mammals of the Galapagos Islands, Ecuador: An Ecotoxicological Quest to the Last Eden Marine Mammal Ecotoxicology: impacts of multiple stressors on population health 2018; 213-34.]. Though CUPs are generally less persistent and bioaccumulative than legacy POPs, some can be acutely toxic pesticides to fish [67Scott GR, Sloman KA. The effects of environmental pollutants on complex fish behaviour: integrating behavioural and physiological indicators of toxicity. Aquat Toxicol 2004; 68(4): 369-92. [http://dx.doi.org/10.1016/j.aquatox.2004.03.016] [PMID: 15177953] , 68Tierney KB, Sampson JL, Ross PS, Sekela MA, Kennedy CJ. Salmon olfaction is impaired by an environmentally realistic pesticide mixture. Environ Sci Technol 2008; 42(13): 4996-5001. [http://dx.doi.org/10.1021/es800240u] [PMID: 18678039] ]. Almost all farmers in Galápagos use CUPs before sowing and during the growth period without taking into account the prescribed usage concentrations of these chemicals which result in mortality of Passeriformes (GJU, pers. obs.). The impact of insecticides and herbicides, along with the potential use of second-generation anticoagulant rodenticides to eliminate introduced rodents (e.g., black rats, Rattus rattus) and associated secondary poisoning are also issues of great concern for birds, particularly raptors such as the Galápagos hawk (B. galapagoensis), Galápagos Short-eared Owl (A. flammeus galapagoensis) and Barn owl (T. alba punctatissima) (JJA, pers, obs.) (Table 2). The second-generation anticoagulant rodenticides (SGARs) are extremely toxic, persistent, bioaccumulative and non-specific, affecting the blood clotting mechanism common to all vertebrates (for a review see Elliott et al. [69Elliott JE, Rattner BA, Shore RF, Van Den Brink NW. Paying the pipers: Mitigating the impact of anticoagulant rodenticides on predators and scavengers. Bioscience 2016; 66(5): 401-7. [http://dx.doi.org/10.1093/biosci/biw028] ], and Rattner [70Rattner BA, Lazarus RS, Elliott JE, Shore RF, van den Brink N. Adverse outcome pathway and risks of anticoagulant rodenticides to predatory wildlife. Environ Sci Technol 2014; 48(15): 8433-45. [http://dx.doi.org/10.1021/es501740n] [PMID: 24968307] ]). However, other species, for example, the Brown Pelican (Pelecanus occidentalis urinator), take advantage of dead animals (namely fish) (GJU, pers. obs.) that may have been exposed to these pesticides. Similarly, high concentrations of Methyl Mercury (MeHg) in yellow-fin tuna (Thunnus albacares) sampled around Galá-pagos waters have been detected [71Muñoz-Abril LJ. Ecología trófica, diversidad genética y contaminación por mercurio del atún aleta amarilla (Thunnus albacares) en la Reserva Marina de Galápagos y el continente ecuatoriano 2016.]. While lead and cadmium levels have been detected in Galápagos Penguin (Spheniscus mendiculus), Flightless Cormorant (Phalacrocorax harrisi) and Waved Albatross (Phoebastria irrorata), a mercury analysis of Galápagos seabirds is currently underway [72Jiménez-Uzcátegui G, Vinueza RL, Urbina AS, et al. Lead and cadmium levels in Galápagos penguin, Spheniscus mendiculus, Flightless Cormorant Phalacrocorax harrisi and Waved Albatross Phoebastria irrorata. Mar Ornithol 2017; 45: 159-63.]. 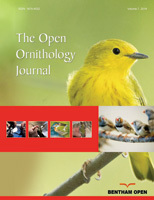 Therefore, it is of paramount importance to measure the exposure to contaminants of the native and endemic birds of the Galápagos because these contaminants are likely to become a threat in the near future with implications at the individual level and popu-lation health [11Alava JJ, Palomera C, Bendell L, Ross PS. Pollution as a threat for the conservation of the Galapagos Marine Reserve: Environmental Impacts and Management Perspectives The Galapagos Marine Reserve: A dynamic socio- ecological system 2014; 247-83., 66Alava JJ, Ross PS, Ikonomou MG, et al. DDT in endangered Galapagos sea lions (Zalophus wollebaeki). Mar Pollut Bull 2011; 62(4): 660-71. [http://dx.doi.org/10.1016/j.marpolbul.2011.01.032] [PMID: 21353 257] , 72Jiménez-Uzcátegui G, Vinueza RL, Urbina AS, et al. Lead and cadmium levels in Galápagos penguin, Spheniscus mendiculus, Flightless Cormorant Phalacrocorax harrisi and Waved Albatross Phoebastria irrorata. Mar Ornithol 2017; 45: 159-63.] (Tables 1 and 2). The Galápagos Islands are volcanic in origin, formed by the eruption of magma generated in the depths of the Earth [73Villagómez D, Toomey D, Geist D, Hooft E, Solomon S. Mantle flow and multi-stage melting beneath the Galápagos hotspot revealed by seismic imaging. Nat Geosci 2014; 7: 151-6. [http://dx.doi.org/10.1038/ngeo2062] ]. This remains a current threat on Isabela and Fernandina Islands, where volcanic activity is frequent and this activity has the potential to affect numerous species, such as Galápagos Penguin (Spheniscus mendiculus), Flightless Cormorant (Phal-acrocorax harrisi), Galápagos American Flamingo (Pho-enicopterus ruber glyphorhynchus) and Mangrove Finch (Camarhynchus heliobates) [9Wiedenfeld DA, Jiménez-Uzcátegui G. Critical problems for bird conservation in the Galápagos Island. Cotinga 2008; 29: 22-7., 74Teasdale R, Geist D, Kurtz M, Harpp K. 2005; Eruption At Volcán Cerro Azul, Galápagos Islands: I. Syneruptive Petrogenesis B Volcanol 67: 170-85. [http://dx.doi.org/10.1007/S00445-004-0371-9] ]. Included among potential disasters are wildfires, as happened on Floreana in the 19th century (human origin) which was possibly one of the causes of the Floreana Mockingbird extirpation from the island [75Nickerson T. The loss of the ship "Essex" sunk by a whale and the ordeal of the crew in open boats. Nantucket Historical Association 1984.]. Species that occur on single small islands or having restricted range would be at greatest risk from wildfires, such as Floreana Mockingbird (Mimus trifasciatus), San Cristóbal Mockingbird (Mimus melanotis), Española Mockingbird (Mimus mac-donaldi), Mangrove Finch (Camarhynchus. heliobates), Genovesa Ground-finch (Geospiza acutirostris), Genovesa Cactus-finch (Geospiza propinqua) and Medium Tree-finch (Camarhynchus pauper). Tsunamis in last decade have also affected the islands and species that breed on the coast are at risk, such as Galápagos Penguin (Spheniscus mendiculus) and Flightless Cormorant (Phalacrocorax harrisi) (GJU per. obs.). However, this threat is unlikely to affect entire populations, just a few local areas, although they could affect important breeding areas like the Marielas Islets (where there are usually between 50-100 breeding Galápagos Penguins) (Table 1). Preserving the genetic diversity is recognized as a priority for the conservation of these avian species [76McNeely JA, Miller KR, Reid WV, Mittermeier RA, Werner B. Conserving the World’s Biological Diversity. International Union for the conservation of nature and natural resources, World Resources Institute, Conservation International, WWF-US and the World Banks, Washington 1990.]. The species with smallest populations in Galápagos are the Mangrove Finch (Camarhynchus heliobates) with less than 100 individuals or Floreana Mockingbird (Mimus trifasciatus) and Galápagos American Flamingo (Phoenicopterus ruber glyphorhynchus) with less of 500 individuals. Species restricted to single islands, such as Genovesa Ground-finch (Geospiza acutirostris), Genovesa Cactus-finch (Geospiza propinqua) and Medium Tree-Finch (Camarhynchus pauper), have a high potential risk from loss of genetic diversity. For example, the population of Floreana Mockingbird (Mimus trifasciatus) on Champion Islet has been lost 39 percent of its heterozygosity, when comparing individuals from 1906 and 2008. The population on Champion Island also differs genetically from the only other population on Gardner by Floreana Island and both likely differ from that of the now-extirpated founder population on Floreana Island [77Hoeck PEA, Beaumont MA, James KE, Grant RB, Grant PR, Keller LF. Saving Darwin’s muse: evolutionary genetics for the recovery of the Floreana mockingbird. Biol Lett 2010; 6(2): 212-5. [http://dx.doi.org/10.1098/rsbl.2009.0778] [PMID: 19923141] ]. Another example is of the Galápagos Penguin (Spheniscus mendiculus), who showed low genetic diversity in relation with Magellanic Penguin (Spheniscus magellanicus) and Humboldt Penguin (Spheniscus humboldti) [78Nims BD, Vargas FH, Merkel J, Parker PG. Low genetic diversity and lack of population structure in the endangered Galapagos Penguin (Spheniscus mendiculus). Conserv Genet 2008; 9: 1413-20. [http://dx.doi.org/10.1007/s10592-007-9465-1] ] (Table 1). Until very recently, Galápagos had no bird species present on the list of extinctions [44Wikelski M, Foufopoulos J, Snell H, Vargas FH. Galápagos birds and diseases: Invasive pathogens as threats for island species. Ecol Soc 2004; 9(1): 5. [http://dx.doi.org/10.5751/ES-00605-090105] ]. However, the first recorded was the Least Vermilion Flycatcher (Pyrocephalus dubius) [17Carmi O, Witt CC, Jaramillo A, Dumbacher JP. Phylogeography of the Vermilion Flycatcher species complex: Multiple speciation events, shifts in migratory behavior, and an apparent extinction of a Galápagos-endemic bird species. Mol Phylogenet Evol 2016; 102: 152-73. [http://dx.doi.org/10.1016/j.ympev.2016.05.029] [PMID: 27233443] ] although there have been extirpations of birds from some islands in the archipelago [79Steadman D, Stafford TW, Donahue DJ, Jull AJT. Chronology of Holocene vertebrate extinction in the Galápagos Islands. Quat Res 1991; 36: 126-33. [http://dx.doi.org/10.1016/0033-5894(91)90021-V] ]. The conservation of long-term of avian diversity on the islands begins with education, prevention, control, mitigation, monitoring and alliances to work together [6Bensted-Smith R, Ed. Visión para la biodiversidad de las Islas Galápagos Fundación Charles Darwin para las islas Galápagos y WWF 2002.]. The cumulative pressure deriving from these threats can generate unnatural or anthropogenic selection forces re-shaping evolution in endemic bird species of the Galápagos. The un-natural selection has already been identified as a human en-vironmental alteration that may be replacing natural selection as the major driving force of evolution in Darwin’s finches [80Deem SL, Blake S, Miller RE, Parker PG. Unnatural selection in Galapagos: The role of disease in Darwin’s Finches (Geospizinae). Galapagos Research 2010; 67: 62-4.]. At present, the human interactions and associated impacts that affect both marine and land birds are of great concern, such as those occurring (i.e. fisheries interactions) with the Waved Albatross (P. irrorata) and the Galápagos Penguin (S. mendiculus) [14Crawford R, Ellenberg U, Frere E, et al. Tangled and drowned: A global review of penguin bycatch in fisheries. Endanger Species Res 2017; 34: 373-96. [http://dx.doi.org/10.3354/esr00869] , 39Awkerman JA, Huyvaert KP, Mangel J, Alfaro-Shigueto J, Anderson DJ. Incidental and intentional catch threatens Waved Albatross. Biol Conserv 2006; 133: 483-9. [http://dx.doi.org/10.1016/j.biocon.2006.07.010] , 40Jiménez-Uzcátegui G, Mangel J, Alfaro-Shigueto J, Anderson DJ. Fishery bycatch of the Waved Albatross Phoebastria irrorata, a need for implementation of agreements. Galápagos Research 2006; 64(2): 7-9.] because these threats are critical to the recovery of their populations (Table 1). Changes in fishing gear technology, incentives for fishing communities and better fisheries management practices at sea need to be further fostered and proactively implemented to mitigate these impacts. On land, the terrestrial birds are basically divided in two groups depending on the magnitude and degree of urbanization and human disturbances, including those species found in inhabited islands where there are negative human-made acti-vities (e.g., collisions by cars, predation by domestic animals, poisoning) and those inhabiting unoccupied islands where the disturbance is minimum (Table 2) [38Jiménez-Uzcátegui G, Betancourt F. Galápagos Report 2007-2008 FCD, PNG & INGALA Bird mortality by vehicles Puerto Ayora, Ecuador 2008; 103-6.]. Habitat loss and fragmentation can be reversed to recover suitable habitat by implementing ecological restoration programs for habitats of indigenous species. Reforestation initiatives utilizing native species within the agricultural areas and replacement of the urbanized-landscape with green-landscape are just two feasible recommendations to achieve this goal. In islands harboring human centers and urbanization, the role of invasive species and emerging infectious diseases are of serious concern because according to the literature and his-torical data, in and out of Galápagos, the results show a dramatic decrease of bird populations, even extinctions [42Jiménez-Uzcátegui G, Carrión V, Zabala J, Buitrón P, Milstead B. Galápagos Report 2006-2007 FCD, PNG & INGALA Status of introduced vertebrates in Galápagos Puerto Ayora, Ecuador 2007; 136-41.-53Kleindorfer S, Dudaniec RY. Host-parasite ecology, behavior and genetics: A review of the introduced fly parasite Philornis downsi and its Darwin’s finch hosts. BMC Zoology 2016; 1: 1. [http://dx.doi.org/10.1186/s40850-016-0003-9] , 55Carrera-Játiva P, Rodríguez-Hidalgo R, Sevilla C, Jiménez-Uzcátegui G. Gastrointestinal parasites in the Galápagos Penguin Spheniscus mendiculus and the Flightless Cormorant Phalacrocorax harrisi in the Galápagos Islands. Mar Ornithol 2014; 42: 77-80., 56Jiménez-Uzcátegui G, Sarzosa MS, Encalada E, Rodríguez-Hidalgo R, Huyvaert KP. Gastrointestinal Parasites in the Waved Albatross (Phoebastria irrorata) of Galápagos. J Wildl Dis 2015; 51(3): 784-6. [http://dx.doi.org/10.7589/2014-06-165] [PMID: 25919468] ]. The introduction of new diseases and parasites can be prevented by biosecurity control at the ports of entry from the continent, with continuity and reinforcement of fumigation and biosecurity control in all means of transport to the Galápagos. In doing so, the ongoing efforts and concerted improvements of management plans to prevent, control and eradicate introduced species and feral animals are of paramount importance to protect endemic and native species in the long term (Table 1). Chemical pollutants (heavy metals and POPs) can be managed if the sources are from human centers (semi-urbanized islands) and the islands, as in the case of oil spills [57Lougheed LW, Edgar GJ, Snell HL. Biological impacts of the Jessica oil spill on the Galápagos environment Final report 2002. ], although these are difficult to control if originating from human sources outside of Galápagos [11Alava JJ, Palomera C, Bendell L, Ross PS. Pollution as a threat for the conservation of the Galapagos Marine Reserve: Environmental Impacts and Management Perspectives The Galapagos Marine Reserve: A dynamic socio- ecological system 2014; 247-83., 63Alava JJ, Ross PS. Pollutants in tropical marine mammals of the Galapagos Islands, Ecuador: An Ecotoxicological Quest to the Last Eden Marine Mammal Ecotoxicology: impacts of multiple stressors on population health 2018; 213-34., 66Alava JJ, Ross PS, Ikonomou MG, et al. DDT in endangered Galapagos sea lions (Zalophus wollebaeki). Mar Pollut Bull 2011; 62(4): 660-71. [http://dx.doi.org/10.1016/j.marpolbul.2011.01.032] [PMID: 21353 257] , 72Jiménez-Uzcátegui G, Vinueza RL, Urbina AS, et al. Lead and cadmium levels in Galápagos penguin, Spheniscus mendiculus, Flightless Cormorant Phalacrocorax harrisi and Waved Albatross Phoebastria irrorata. Mar Ornithol 2017; 45: 159-63.]. Concerted local and global management strategies are also strongly needed in the decision making processes to protect the Galápagos Marine Reserve and National Park from chemical pollution and biological assaults [11Alava JJ, Palomera C, Bendell L, Ross PS. Pollution as a threat for the conservation of the Galapagos Marine Reserve: Environmental Impacts and Management Perspectives The Galapagos Marine Reserve: A dynamic socio- ecological system 2014; 247-83., 63Alava JJ, Ross PS. Pollutants in tropical marine mammals of the Galapagos Islands, Ecuador: An Ecotoxicological Quest to the Last Eden Marine Mammal Ecotoxicology: impacts of multiple stressors on population health 2018; 213-34.]. The Galápagos Islands are a natural laboratory and have many species unique in the world, evolving over thousands of years and surviving natural events. However, concentrations of CO2 are more in the present day (> 400 ppm) than a million years ago resulting in accelerated global warming and influe-ncing natural events such as ENSO events, which in turn impact the bird populations in the archipelago with both negative (seabirds) and positive (land birds) impacts [8Vargas FH, Harrison S, Rea S, Macdonald DW. Biological effects of El Niño on the Galápagos Penguin. Biol Conserv 2006; 127: 107-14. [http://dx.doi.org/10.1016/j.biocon.2005.08.001] , 28Vargas FH, Barlow S, Har T, et al. Effects of climate on the abundant and distribution of flamingos in the Galápagos Islands. JPN J Zool 2008; 276: 252-65. [http://dx.doi.org/10.1111/j.1469-7998.2008.00485.x] , 76McNeely JA, Miller KR, Reid WV, Mittermeier RA, Werner B. Conserving the World’s Biological Diversity. International Union for the conservation of nature and natural resources, World Resources Institute, Conservation International, WWF-US and the World Banks, Washington 1990., 81Pearson PN, Palmer MR. Atmospheric carbon dioxide concentrations over the past 60 million years. Nature 2000; 406(6797): 695-9. [http://dx.doi.org/10.1038/35021000] [PMID: 10963587] ]. While natural events such as El Niño have been affecting the Galápagos species for thousands of years, these species are resilient and have adapted to the changes imposed by these events [24Wang G, Cai W, Gan B, et al. Continued increase of extreme El Niño frequency long after 1.5°C warming stabilization. Nat Clim Chang 2017; 7: 568-72. [http://dx.doi.org/10.1038/nclimate3351] ]. However, ENSO events exacerbated by anthro-pogenic climate change (Table 1) threaten marine birds, which are being affected when their population numbers are declining [13Vargas FH, Lacy RC, Johnson PJ, et al. Modelling the effect of El Niño on the persistence of small populations: The Galápagos penguin as a case study. Biol Conserv 2007; 137: 138-48. [http://dx.doi.org/10.1016/j.biocon.2007.02.005] , 25Valle CA, Coulter MC. Present status of the Flightless Cormorant, Galápagos Penguin and Greater Flamingo populations in the Galápagos Islands, Ecuador, after the 1982-83 El Niño. The Condor 1987; 89: 276-81. [http://dx.doi.org/10.2307/1368480] , 26Valle CA, Cruz F, Cruz JB, Merlen G, Coulter MC. The impact of the 1982-83 El Niño-Southern Oscillation on seabirds in the Galápagos Islands, Ecuador. J Geophys Res 1987; 92: 437-44. [http://dx.doi.org/10.1029/JC092iC13p14437] , 28Vargas FH, Barlow S, Har T, et al. Effects of climate on the abundant and distribution of flamingos in the Galápagos Islands. JPN J Zool 2008; 276: 252-65. [http://dx.doi.org/10.1111/j.1469-7998.2008.00485.x] ]. Meanwhile, some lands bird species exhibit increased population numbers, but with uncertainty and consequences in the future as their natural habitat could be expected to change with the emergence of biological invasion by introduced species. In this case, any proposal to implement actions to mitigate the effects of climate change should involve a pathway to enhance the conservation of the resilience and adaptive capacity of species and protection of their habitats. If anthropogenic stressors continue contributing to the perturbation of natural habitats and behavior of species, the natural evolutionary forces normally ruling speciation and radiation can be lost in the long term and, therefore, difficult to characterize, monitor, and preserve in its genuine state unless management and mitigation strategies are urgently implem-ented to minimize and reduce anthropogenic factors in the Galápagos [11Alava JJ, Palomera C, Bendell L, Ross PS. Pollution as a threat for the conservation of the Galapagos Marine Reserve: Environmental Impacts and Management Perspectives The Galapagos Marine Reserve: A dynamic socio- ecological system 2014; 247-83., 82Jiménez-Uzcátegui G, Llerena W, Milstead WB, Lomas EE, Wiedenfeld DA. Is the population of the Floreana mockingbird Mimus trifasciatus declining? Cotinga 2011; 33: 1-7.]. Relying on an out of the box approach to contribute with effective conservation fronts (Tables 1 and 2) to understand what would be the case if threatened species (e.g., endemic) of Galapagos bird populations are dramatically reduced and which should be the minimum number of a given population to intervene in the natural process, we propose as a recom-mendation to follow the 50/500 rule developed almost 40 years ago [83Franklin IR. Evolutionary change in small populations. Conservation Biology: An evolutionary-ecological perspective. In: Soule ME, Wilcox BA, Eds. Sinauer Associates 1980; 135-50.] as a guiding principle in conservation for assessing minimum viable effective population size in birds [84Jamieson IG, Allendorf FW. How does the 50/500 rule apply to MVPs? Trends Ecol Evol (Amst) 2012; 27(10): 578-84. [http://dx.doi.org/10.1016/j.tree.2012.07.001] [PMID: 22868005] ] in order to maintain the long-term genetic diversity in current and future conservation programs. In Galápagos, some putative examples of the application of this rule exist with endemic reptiles, but in birds, this seems only to be applied for the Mangrove Finch (C. heliobates).